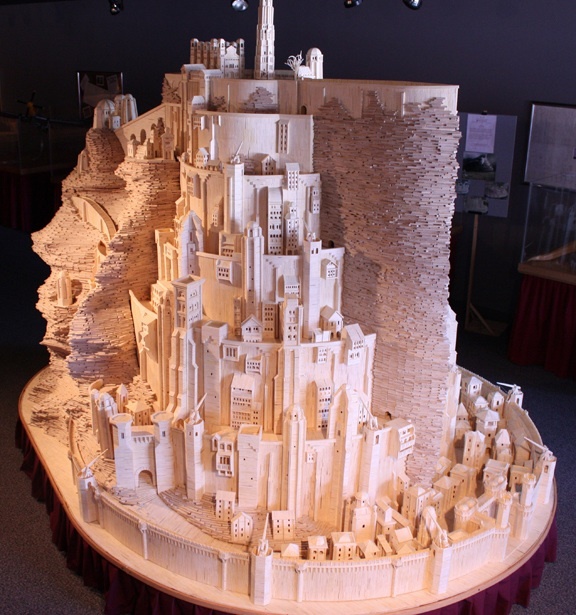 Using 420,000 matchsticks Patrick Acton created an amazing matchstick sculpture of the Minas Tirith city from The Lord of the Rings. It is currently on display through 2011 at Matchstick Marvels Tourist Center in Gladbrook, IA. Acton’s version of Minas Tirith is one of his biggest and most detailed matchstick models yet, as he has constructed his rendition of the tremendously ancient city that Tolkien says “appears hewn from the rock of Mount Mindolluin” in the White Mountains. Tolkien’s fortress city is said to tower 700 feet above the Pelennor Fields in Middle Earth’s land of Gondor. Acton’s matchstick version of the seven-level city was started in 2007 and took nearly three years when completed in February 2010. The Minas Tirith model contains hundreds of city buildings and is topped with the Citadel, the Tree of Gondor, and the White Tower of Ecthelion.